Rancho Park Hole 2 (left): At nearly 440 yards and uphill, this hole requires two long and accurate shots. Huge trees line the right side of the fairway and will preclude and ball hit near there from an open shot to the rather small green. There is OB left on both shots, so overcompensation is not an option. The green has good contours and will reject any shot not hit near its center. Rancho Park Hole 4 (below): This golf hole is enjoyable and important to the round as it is the last par 5 until number 17. A good drive that finds the right-center of the fairway will provide an opportunity to fly the enormous greenside bunker and reach the green in two. The green is huge, so even those who lay up will need to hit their approach close to avoid difficult putts. Rancho Park Hole 5: This uphill par four doglegs right around some huge trees. Any pin cut right of center necessitates a drive center or left of center to avoid being blocked off. Shots going long and left of the green may end up with bounding down a hill and leaving a rough up an down. 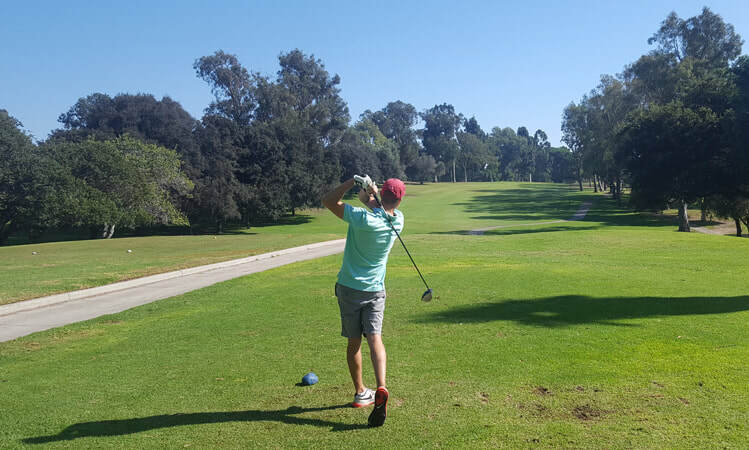 Rancho Park Hole 10: Similar to #5, the tee shot is critical on this uphill dogleg right. 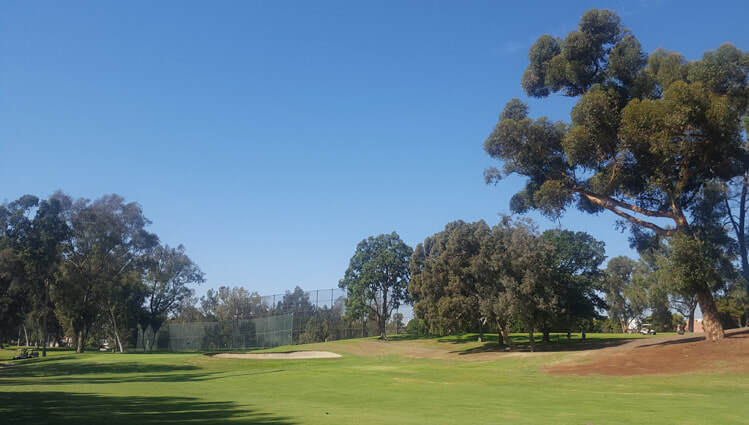 The fairway is wide, undulating and surrounded by huge eucalyptus trees. It is difficult to judge the distance of the drives so the scorecard must be believed. A solid drive must find the center or left side of the fairway to hit the green as it is tucked way right behind the trees. The green is also perched on a steep hill, so anything going long or right will leave a very difficult chip. Rancho Park Hole 11: Rancho Park has a lot of ho-hum par fours. The 2nd, 15th and this hole are the exceptions. At 450 yards, this straight one requires two really solid shots to make par. Rancho Park Hole 13: This short par 4 is mentioned because of its quirky nature. There is OB left and the fairway slopes sharply from left to right. About 250 yards out, the fairway drops sharply to a mezzanine level where the temporary green is located. From there, it drops again in roller coaster fashion to the true green, leaving a semi-blind approach. Although it isn’t a great golf hole, the approach is always fun because it can be played a multitude of ways and is fairly unique. 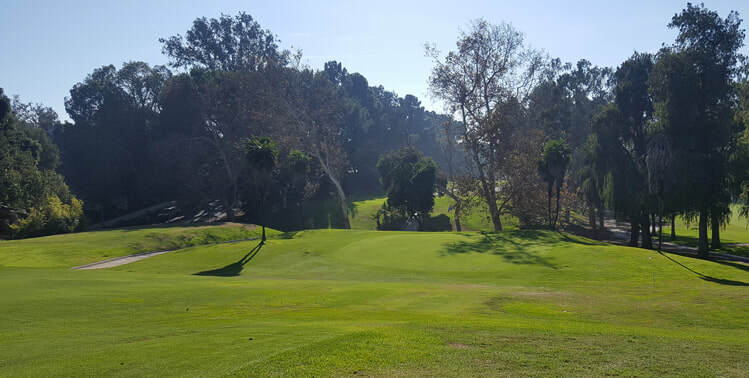 Rancho Park Hole 15: Overall, this long par four may be the most demanding on the course as, in addition to the trees on either side, the bunkers are well-placed to cause extra trouble on both shots. 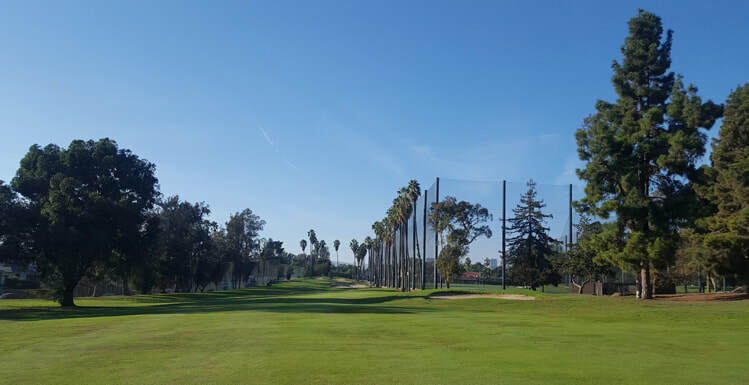 Rancho Park Hole 18: If the 15th hole is the most demanding, the closing par five is the most terrifying, not for any golf shot value, but from the absolute fear that is generated by being on the fairway sitting next to one of the most busy driving ranges in the world, with nets that are not high enough. There are dozens of balls lining the fairway, and some Johnny-can't-swing is two beers deep and ready to pop one over the fence and brain the unsuspecting golfer. Although not an official local rule, if the player can get the ball in play on their second shot, I call automatic par and walk up the hole away from the fairway, leave your ball and live to play another day.